If you want to decorate Easter eggs this year, try something different than dye! 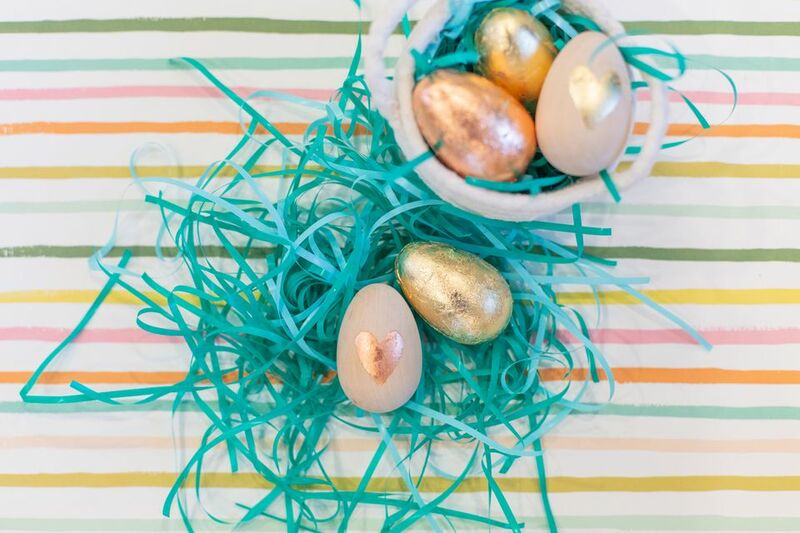 These no-dye, metallic leaf Easter eggs are fun, modern, and a cool twist on the usual Easter egg tradition. This simple DIY project is ultra-customizable, from the color of the metallic leaf to the patterns that you choose. And if you use faux eggs, you can save and reuse them each year! As you're gathering materials for this project, consider how you like to display your Easter decor! If you want to hang on to these eggs year after year, you can find some faux eggs; however, the technique will work on real eggs as well. 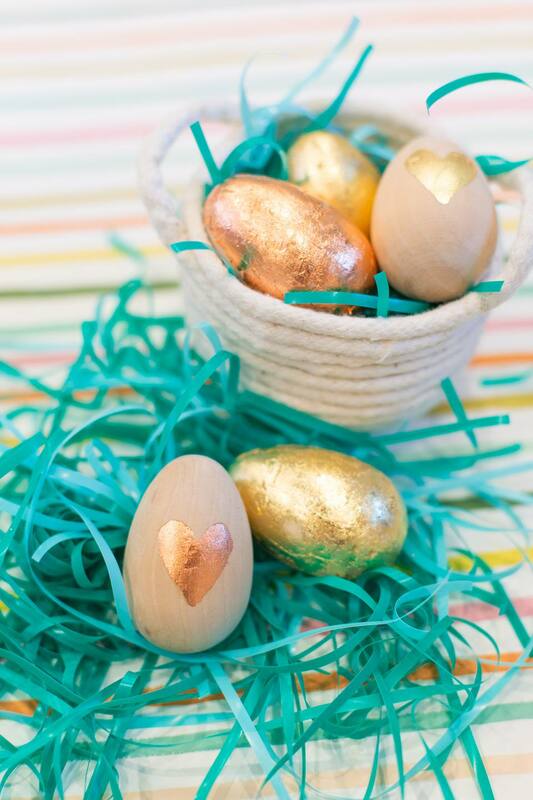 If you're using faux eggs, they'll need to be made of wood or another material that the adhesive will stick to (regular plastic Easter eggs won't work). Also note that you can find lots of shades of metallic leaf at craft stores–gold, silver, bronze, rose gold, and more. Find your favorite or mix them up like we did! Start by painting on the adhesive to the surface of the egg. Start with a thin coat and add if needed. You should never have so much adhesive that it starts to pool. Once the adhesive is painted on, allow the adhesive to dry for a minute or two until it starts to feel very tacky. Carefully and gently apply a sheet of metal leaf over the adhesive. You may have to tear off some smaller sections from your sheet of leaf and apply around the egg to get full coverage. If you have the type of leaf that is attached to a sheet, press the sheet around the egg and pull the sheet away so that the leaf sticks to the adhesive. Use a dry, fluffy, semi-stiff brush to buff and burnish away the excess gold leaf. This is best done over a bag or trash can to catch all of the flakes as they buff off. Continue until you have a smooth, shiny surface. If you find that when you were buffing the leaf some sections peeled off and exposed the egg underneath, repeat the process from the beginning, applying a thin layer of adhesive just to the exposed areas, then adding more gold leaf and buffing again. If you'd like to try some smaller detailed patterns or images, use a small, thin brush to brush on your adhesive in your desired pattern, like this heart. You could write words, create dots or stripes, draw flowers, or just about anything you can imagine! The key here is finding a brush that is delicate enough to create thin lines using the adhesive. Be sure to allow the adhesive to dry a bit before you add the leaf. Repeat the burnishing and patching process as needed. Put your pretty eggs out and enjoy!